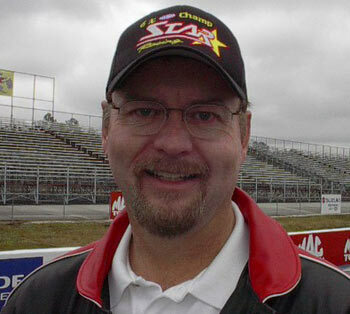 George Bryce and Byron Hines have produced one of the greatest rivalries in the history of dragbike racing. In this article Bryce talks about what it’s like to compete against the intensity of Vance and Hines and discusses his chances of breaking up his rivals recent championship streak. Competition brings out the best. Perhaps the most fierce and entertaining competition over the last two decades in motorcycle drag racing has been between two-wheel moguls George Bryce of Star Racing/G-Squared and Byron Hines of Vance and Hines. 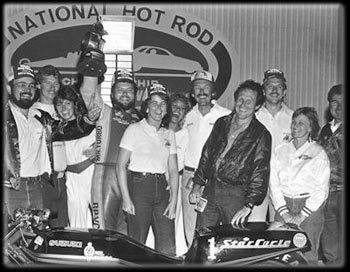 These innovative dragbike pioneers have long been the Pro Stock Motorcycle category’s two top engine providers and together they have continually pushed each other to new heights. The intense rivalry has roots that date as far back as the 70s, but the clash escalated exceedingly in the 90s. In the early 90’s the legendary duo of Dave Schutlz and John Myers engaged in one of the greatest rivalries in the history of the NHRA. Myers was the flagship rider for the Star team and Schultz was more often than not powered by Vance and Hines. In the late 90’s the contention between the two shops reached new heights and turned into a bitter personal battle between Star’s Angelle Sampey and Vance and Hines’ Matt Hines. Amidst the clash Hines and Sampey both emerged as three-peat champions with Hines winning the crown from 1997-1999, and Sampey earning the season title from 2000-2002. Today the rivalry still exists and is as potent as ever. However it’s a much altered battle. Both squads have shifted their primary focus from the four-cylinder GS Suzukis to state-of-the-art V-Twins. 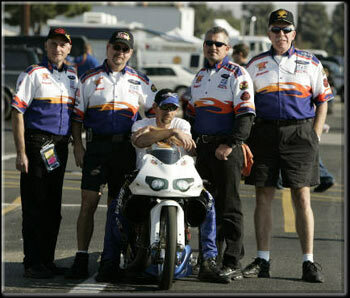 Vance and Hines have developed the Harley Davidson V-Rod and Bryce was instrumental in bringing the S&S powered Buells to the NHRA. As of late Vance and Hines has seemed to gain the upper hand in this battle for PSM supremacy and Andrew Hines, rider of the leading Vance and Hines V-Rod, has won the championship the last three years in a row. However all indications, including G-Squared/Buell rider Chip Ellis’ 6.92 run in Gainesville , lead one to believe this could be the year of the Buells. Cycledrag.com spoke with Bryce about this ongoing quarter-mile war. “I believe your only limitations in racing are budget and imagination. Terry Vance and Byron Hines have done a great job over the years amassing connections to build a budget that allows Byron to use his unbelievable imagination to help them go really fast. If you look throughout motor sports, the guys with the best imagination and the best budget to use that imagination are the ones that win,” Bryce said. Bryce, now with funding from sponsors like Drag Specialties and S&S, feels as if he has reached a point where he has the resources to compete with Vance and Hines’ Harley Davidson backing. In 2006 Bryce’s team proved to be a serious threat at times. “Sometimes it’s easy to feel like you are out of your league racing those guys but last year when we qualified No. 1 at seven out of 15 races it was a big pat on the back for me and George Smith (co crew chief) personally, knowing what imagination and budget we were working against,” Bryce said. Bryce is proud of each accomplishment because he fully understands just how tough his competition is. Bryce believes Vance and Hines has the wherewithal to succeed in nearly any form of racing. Bryce and Hines have a mutual respect for one another and Bryce says he realized long ago Vance and Hines will always thrive on the competition his teams provide. So the question remains – What will 2007 and the next chapter of this rivalry hold? For 2007 Bryce has been hired by Karl Klement to tune rookie Peggy Llewellyn. He will also be keeping a watchful eye on the rider he tuned last season, Chip Ellis. Bryce is excited about the new opportunity and believes although Llewellyn is a technically an NHRA rookie, she has the skills and equipment to compete for a championship. Bryce believes between the teams of Llewellyn and Ellis he may have the firepower necessary to break up Vance and Hines’ bid for a fourth consecutive title. “We’re pretty fired up about our chances this year but I learned a long time ago to stop making predictions. The last couple years everybody went in the sixes during testing but then the season starts and we didn’t see what we thought we were going to see. You never know what’s going to happen, but we’ll do our best to win,” Bryce said. Bryce says despite the fun of the rivalry and the challenge of winning another title, it’s the friendships he’s made within the industry that keep him going.